What if Rey hadn’t grown up all alone on dusty planet Jakku, but instead had a galaxy of friends to play with? New York Times bestselling author of the Darth Vader™ and Son series Jeffrey Brown returns to the Star Wars galaxy with a collection of brand-new adventures starring young Rey and Kylo, Finn and Poe, Hux and Phasma, Rose and BB-8—all under the watch of Luke, General Leia, Han, and Chewie. Whether it’s Kylo trying to use the Force to cheat at Go Fish, Poe bowling with BB-8, or Rey lifting rocks to play hide and seek, Jeffrey Brown’s charmingly hilarious vision will delight Star Wars fans of all ages. 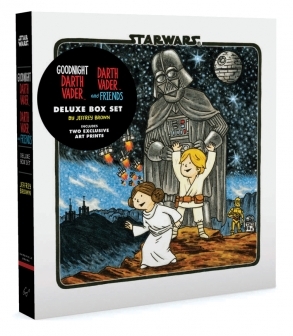 This deluxe gift box set reproduces the first two books in the series in a large format—perfect or sharing with young Jedi—that showcases Brown's funny, colorful work. The slipcase edition also includes two unique, frameable art prints created just for this set as well as custom artwork for the slipcase box. This funny and sweet new book offers an intimate look at the friendships between best pals in the Star Wars® universe, from Darth Vader™ and the Emperor to Leia and her Ewok pals, Han and Chewie, C-3PO and R2-D2, the bounty hunters, and other favorite characters. It's bedtime in the Star Wars® galaxy, and Darth Vader's™ parenting skills are tested anew. In this Episode, the Sith Lord must soothe his rambunctious twins, Luke and Leia—who are not ready to sleep and who insist on a story. 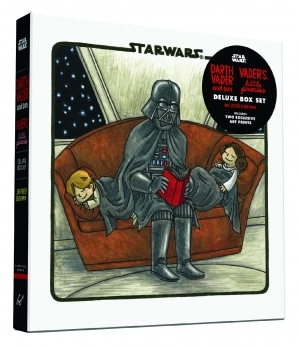 As Vader reads, they tuck in, yawn, and settle down to dream. In this irresistibly funny follow-up to the breakout bestseller Darth Vader™ and Son, Vader—Sith Lord and leader of the Galactic Empire—now faces the trials, joys, and mood swings of raising his daughter Leia...as she grows from a sweet little girl into a rebellious teenager. This deluxe gift set reproduces the last two books in the series in a large format—perfect for sharing with young Jedi—that showcases Brown’s funny, colorful, and heartfelt artwork. This slipcase edition also includes two unique, frameable art prints created just for this set, as well as custom artwork for the slipcase box. Jeffrey Brown’s reimagining of the Star Wars universe has delighted adult fans and young Padawans alike. This new adult coloring book is equally fun to share, featuring a careful translation of artwork from the bestselling Darth Vader™ and Son series to a large-format collection on crisp white paper, plus nine new images to color. Featuring Jeffrey Brown’s charming and humorous artwork, this full-color flexi-journal is filled with the galactic shenanigans of young Rey and friends. This charming collection of postcards brings Darth Vader™ and Son author Jeffrey Brown’s warm humor to the adventures and hijinks of young Rey and her friends, including exclusive artwork—perfect to keep or send.